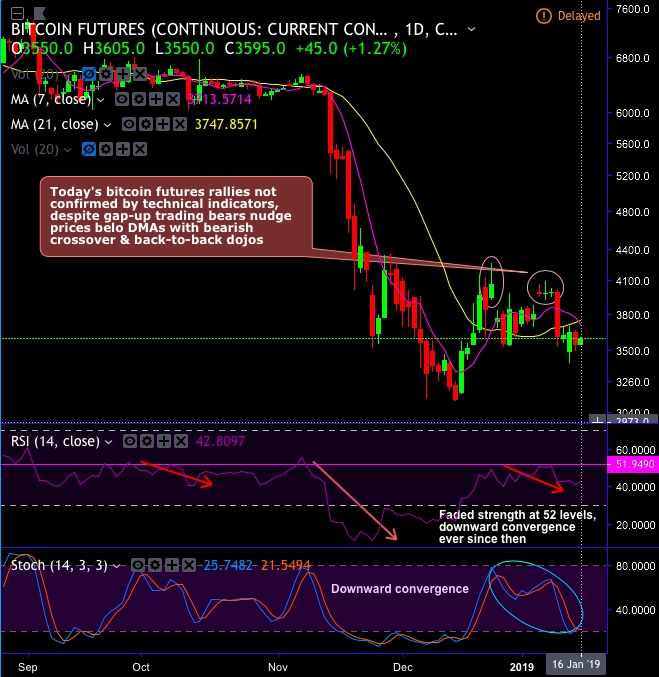 Today's rallies of bitcoin futures on CME are not confirmed by technical indicators, you could easily observe that despite gap-up trading in the recent past, the bears nudge prices below DMAs with bearish crossover, the occurrences of back-to-back dojis followed by bearish engulfing pattern candles. From this price behavior of the cryptocurrency avenue, it appears that the market is little skeptical about Bitcoin’s recovery. There have been some indications in the futures market that investors are carrying dubious eyes on this underlying security. Bitcoin (BTC) is trading at around $3,723.20. Meanwhile, futures contracts have recorded a discount of almost $100 as these derivatives contracts of January delivery are currently being traded for $3,620. February contracts are being traded for $3,550 levels, while June futures are being traded for $3,450. These Bitcoin derivatives are traded on the Chicago Mercantile Exchange (CME) that are cash-settled contracts to enable clients to buy and sell Bitcoin at a predetermined price and predetermined date in the future. This arrangement facilitates investors to mitigate price risks in the specified future. The price discounts that traders pay for Bitcoin at CME’s futures indicates the bearish sentiments despite mild recovery above $4k mark a week ago. Hence, it also enables them to speculate with its price. During bearish outlook, the investors anticipate the underlying (Bitcoin price) to be on a lower side in the future due to the various destructive factors such as some important announcements in this Q1’2019. If at all, Bitcoin futures contracts begin to trade at a premium price compared to Bitcoin’s spot price, then that is perceived as a constructive factor for the crypto-space. Currency Strength Index: FxWirePro's hourly BTC spot index is inching towards 132 levels (which is bullish), while hourly USD spot index was at 28 (mildly bullish) while articulating (at 13:11 GMT).